Against all odds, a juvenile albino Risso’s dolphin has been spotted in the wild again after it was last seen as a baby back in 2015. 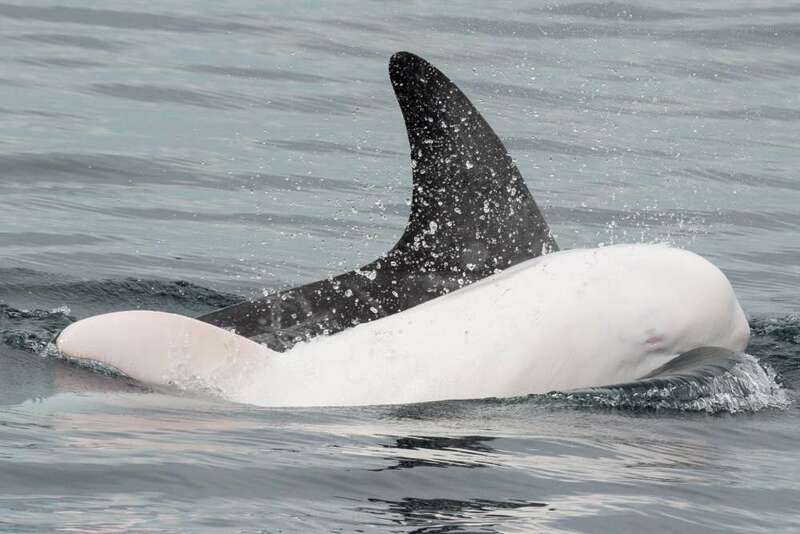 This super-rare white dolphin was spotted in the waters off Monterey Bay in California last week by Kate Cummings of Blue Ocean Whale Watch. She quickly made contact with researchers from Marine Life Studies, who currently study the population dynamics of Risso's dolphins, to help her confirm it was the same albino calf and mother she documented two years ago (image below) in September of 2015. The pair has now been cataloged with an ID to help track their whereabouts in the future. Life is particularly tough for animals with a lack of pigment, as it makes them stand out to predators. Their albinism (or leucism, see below) is also tied to numerous health complications, namely poor eyesight, problems with echolocation, and an extreme susceptibility to sunlight. As such, it's exceptional news that this individual has happily survived for two years out in the wilderness. "If the animal has an impaired immune system or echolocation system, it might rely on others for help in feeding," Josh McInnes, researcher coordinator at Marine Life Studies, told IFLScience. "We do not know much about the foraging patterns of Risso's dolphin. We do know they specialize in squid. This animal may find feeding easier by group living." Living in its natural environment, allowing them to dive to deeper depths to avoid sunlight, is also likely to help. "I wonder the outcome for the white Risso though," he added. The small dolphin appears yellow due to diatoms, unicellular algae, growing on its skin. It’s also up for debate whether it is a true albino or perhaps “leucistic”, a condition in which there is partial loss of pigmentation. However, the first picture of the dolphin appears to show it has pink eyes, indicating that this might be a true albino animal. Risso's dolphins (Grampus griseus) are notoriously shy, although they can be found in temperate and tropical waters across the globe. They tend to only hunt at night for creatures in the neritic zone of the ocean, approximately 200 meters (660 feet) in depth, such as squid. However, if they do make a rare appearance, they are easily recognized by their unusual, bulbous head. Since this species is so widely distributed, it's difficult for researchers to put exact figures on the population strength of this species. Nevertheless, assessments by the IUCN Red List puts them in the "Least Concern" category.